It is often said that it is extremely important for the organizations to provide a healthy work environment, in order to attract and retain qualified, highly committed, and loyal workforce, because committed and loyal employees reinforce employees’ motivation to act in the best interest of organizations they work for. Employees’ loyalty is important for the organization because employees are a vital resource for the organization, especially since they represent a significant investment in term of locating, recruiting, training let alone salaries, welfare plans, bonuses and rewards etc. Loyalty, as a general term, signifies a person’s devotion or sentiment of attachment to a particular object, which may be another person or group of persons, an ideal, a duty, or a cause. It expresses itself in both thought and action and strives for the identification of the interests of the loyal person with those of the object. Employee loyalty can be defined as a psychological attachment or commitment to the organization and develops as a result of increased satisfaction. Satisfaction results from a process of internal evaluation, and if an employee’s expectation level is met or exceeded, then satisfaction grows. Employee loyalty then develops into a generalized emotional attitude towards the organization. In other words, the more satisfied an employee is regarding his working environment, the more likely that he develops a sense of commitment towards the organization in general. Employees’ loyalty towards organization is often referred as organizational loyalty of the employees. It is the most important factor that determines the effectiveness and efficiency of the organization. It is the one of the key elements that measures the compatibility between employees on one hand and the organization on the other hand, since if this compatibility increases, the organization achieves a lot of its goals and aspirations. Employees with loyalty towards organization are committed employees with a sense of belongingness towards the organization. Such employees accept the organizational goals and values and have psychological attachment to the organization. These employees identify themselves with the organization. In general, employees’ loyalty can be best described in terms of a process, where certain attitudes give rise to certain behaviours (intended or actual). In the last three to four decades, there have been major changes in the industrial world. In the past, once hired, an employee believed that it was a life time job and the management expected their unstinted loyalty towards the organization. Similarly, the employees used to be devoted to their organization. This image of loyalty because of the employment has gradually changed with the advent of globalization when employees began to face restructuring, relocations of the manufacturing, and downsizing. Organizations ‘broke the rules’, mutual obligations are reconsidered, life time employment and devotion is no longer expected, job hopping is considered to be a normal phenomenon, and people constantly striving for higher salaries or better working conditions has become a normal thing. Loyalty and trust have become more difficult to obtain and give in the work place. Employees’ loyalty seems like a quality that is now becoming increasingly harder to find. In the present day global environment, organizations are often confronted with the fact that today’s definition of employees’ loyalty is inherently complex. No longer is the traditional notion of employees’ loyalty – once defined as a lifetime relationship with a particular employer – appropriate in the current scenario of layoffs, mergers and talent wars. In other words, a longer tenured employee does not necessarily and sufficiently indicates high loyalty towards the organization. Employees’ loyalty normally has two dimensions namely (i) internal, and (ii) external. Loyalty is, fundamentally, an emotional attachment. The internal dimension is the emotional component. It includes feelings of caring, of affiliation and of commitment. This is the dimension that must be nurtured and appealed to. The external dimension has to do with the way loyalty manifests itself. This dimension is comprised of the behaviours that display the emotional component and is the part of loyalty that changes the most. The first step is to redefine loyalty as internal feelings that can be manifested in a variety of new ways. Instead, what happens most often is that the leaders of an organization feel that they are very loyal to their employees and that the organization has policies in place to reflect that-but that workers don’t understand what management is trying to do. On the other hand, employees who feel they are very loyal to their organization are not demonstrating it in ways management understands. The terms of the loyalty are far different from what they were in the past. Rather than a blind organizational allegiance, employees show their commitment through their efforts for the organization. Presently there is a trend towards globalization and liberalization. In such an environment, employees are becoming the competitive advantage an organization. An organization may manage with employees with average caliber, but competent employees can take an average organization to greater heights. Likewise, average employees can cause the downfall of a flourishing organization. In the present day market situation which is full of competition, having capable employees and developing employees’ loyalty becomes increasingly important and a continuing challenge for the organization. In the present environment, it becomes a necessity for the organization to have a strategy for retaining their key experts and crucial skilled employees. As there is a tendency amongst the organizations to lure away the top performers of the competing organization, management strategies must therefore give due consideration and sufficient resource allocation to keep employees motivated and satisfied. The idea is that the satisfied employee is less likely to pursue greener pastures. Thus, implementing desirable human resource management policies have a positive effect on employee loyalty. Employees’ loyalty towards organization refers to their adoption of the values, attitudes and beliefs of the organization and their willingness to exert additional effort to achieve the goals and objectives of the organization. It is multidimensional in nature and involves the employees’ commitment, attitude and behaviour for the organization. Employees’ loyalty makes them to show their concern for the organization and its continued success and wellbeing. Organizational commitment of the loyal employees is the degree to which the employees identify with the organization and its goals, and wish to continue with the organization. There are three types of commitments identified. These are (i) normative commitment, (ii) affective commitment, and (iii) continuing commitment. Normative commitment is define as organizational commitments. Affective commitments are define by emotional attachments, identification, and involvement to achieve the goal of organization. Continuing commitment is the willingness to remain in an organization because of different investments. Employees’ loyalty makes the employees committed to their work. They hold a strong sense of duty towards their work, and place intrinsic value on work. These employees are motivated towards work and have a strong job involvement. Work becomes part of their life. Employee attitudes towards the organization then give rise to the behavioral component of loyalty. An employee who has developed affection to the organization is more likely to demonstrate loyal behaviours and work towards the overall goals of the organization, such as improved productivity, greater efficiency, and a high-quality service orientation to customers. 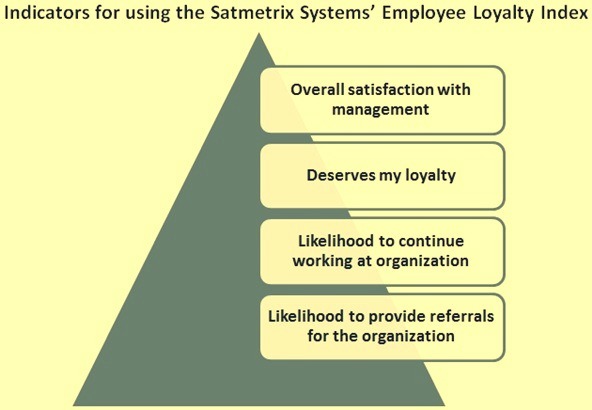 Both the attitudinal and behavioral components of employee’s loyalty can be measured by aggregating four indicators into a single metric that can be monitored over time using the Satmetrix Systems’ Employee Loyalty Index (ELI). These indicators include (i) overall satisfaction with the management (ii) deserves my loyalty, (iii) likelihood to continue working at organization and (iv) likelihood to provide referrals for the organization (Fig 1). The first two indicators measure the attitudinal component of the employee’s loyalty and others measure the behavioral component of the employee’s loyalty. Using the ELI, not only can levels of overall employee’s loyalty be measured and tracked over time as leading performance indicators, driver analyses can also be conducted to determine which specific attributes of the working environment most impact employee’s loyalty. Empirical evidence has shown that the organizations which maintain high employee’s loyalty scores also enjoy high levels of customer loyalty and organizational profitability. Organizations nowadays strive to achieve the loyalty of their employees more than in the past, especially among the industrial organizations such as in which the participation and the status of the employees not only depend on the number of years spent by the employees in the organization, but also on its qualification and experience in taking the decisions that affect the future of the organization. The significance of the employees’ loyalty for the organization lies in its potential to increase the organizational efficiency. It is important for teamwork and for improving the employee’s productivity. In the long-term, finding and retaining employees are the critical issues for the success of the organization. The Sloan Study found that there are clear-cut links between the employee’s loyalty and organizational performance. The way in which human resources are deployed and managed is the key factor in achieving competitive performance. As the change in generation has brought about a change of work ethics, the way human resources are managed reflects new patterns of behaviour from the boardroom to the shop floor. As management treatment of employees has an effect on employees’ sense of commitment and loyalty, there is a correlation between human resource management policies and employees’ loyalty. There are many drivers for the employees’ commitment and loyalty to the organization. As per one survey the five top drivers of employees’ commitment and loyalty are (i) management recognizes the importance of personal and family life, (ii) the organization provides opportunities for personal growth, (iii) the organization is satisfying customer or societal needs, (iv) management communicates information about employee benefits, and (v) co-employees’ skills keep pace with the skill demands of the job. Organizations that help employees to manage the dual demands of work and home have better employees’ loyalty. Also employees are more committed and are more willing and likely to work harder if they perceive that their on-the-job contributions are valued and that the organization cares for them. By taking affirmative steps to create a work environment whereby an employee is valued can enhance his loyalty. Fairness, quality of supervision and support for employee life style are essential elements in employees’ loyalty. The main drivers of employees’ loyalty are (i) participation in goal setting, (ii) performance feedback, (iii) supportive communications with immediate supervisors and upper management, (iv) justice in performance appraisals, (v) objective measurements of performance, (vi) sufficiency of pay, benefits and rewards, (vii) quality of supervision, (viii) favourable developmental opportunities, and (ix) clearly stated guidelines defining appropriate work behaviour and job demands. Building of the employees’ loyalty and retaining employees is not a very expensive affair. Further pay packets are not the only reason for the employees to leave the organization. By spending some time and attention on issues important to employees, management can improve the employees’ loyalty for the organization. The main drivers of employees’ loyalty identified by one of the report are (i) fairness, (ii) care and concern for employees, (iii) satisfaction with day to day activities, (iv) trust in employees, and (v) reputation of the organization, work and job resources. According to a survey carried out in the industrial organizations, there are at least seven major drivers which are more important than compensation that enhances employee loyalty. These drivers are (i) communication, (ii) diversity and inclusion, (iii) job satisfaction, (iv) flexibility, (v) management effectiveness, (vi) work-life support, and (vii) career advancement. According to another survey at international level the main drivers of employees’ loyalty have been identified as (i) open and honest communication, (ii) strong teamwork, (iii) giving employees recognition, (iv) rewarding the right people, (v) having visible values lived, (vi) job interest/variety, (vii) development of employees, (viii) the talent of colleagues, (ix) strong leadership, and (x) a strong employer brand in recruitment market. Most of the drivers for the employee’ loyalty are directly under management’s control, Hence, once management understands what drives employee loyalty, appropriate steps can be taken to boost loyalty and retain employees. The following steps by the managements can enhance employees’ loyalty.